"Greensboro, N.C. – Northern Middle students are learning and providing fresh fruits and vegetables for local people in need thanks to their greenhouse and garden. 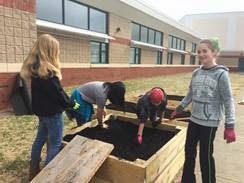 Now, thanks to a $3,000 grant from Lowe’s Toolbox for Education, the school and students will expand the greenhouse and raised garden beds at the school. 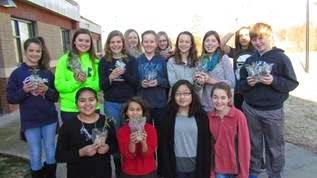 Northern Middle School’s garden club has been learning about food deserts and exploring strategies to help those in need. Food deserts are areas where 33 percent of residents live more than one mile from a full-service grocery store and where more than 20 percent of residents considered living in poverty. The garden club will use the grant money to expand its garden and upgrade its greenhouse. This year, the garden club raised vegetable plants from seeds for their garden. Extra plants were donated to other school gardens in Guilford County Schools. More than 125 plants were donated. Produce raised in Northern Guilford’s garden will be donated to Share the Harvest. The garden will also be used for curriculum enrichment activities in all subject areas. The project is scheduled to be completed by the fall of 2015. "The Lowe's Toolbox for Education program delivers on Lowe's commitment to improve the educational environment for students across the country," said Maureen Ausura, chairwoman of the Lowe's Charitable and Educational Foundation. "We're honored to work with Northern Guilford Middle School to support the needs of our local students, teachers and families." Northern Middle is one of more than 500 schools across the United States to be awarded a Lowe’s Toolbox for Education grant for improvement projects during the 2014-15 school year. “We started the Grub Club at Northern Middle because the area is ranked as a top area in the U.S. for hunger,” said student Emilie Morton. “I love Grub Club, because I am doing what I love while making a difference.”"